Both of my kids love crêpes. Since my daughter discovered the blender method, which is quick and yields lump-free batter, we have them often for breakfast (and sometimes dinner). Leftover batter stores beautifully in the fridge for a quick DIY weekday breakfast spread with butter and jam (just be sure to stir the batter before using, and thin it with a little milk if necessary). Though my son prefers these with powdered sugar and lemon juice, they are also good filled with fried apples or sautéed spinach, bits of bacon, and cheese. Crack the eggs into a blender, add the milk, cover the blender, and whiz until smooth. Add the salt and flour and blend for 10 seconds. Stop blending and scrape down the sides of the blender, then blend until smooth, another 10 seconds. The batter should be the consistency of half-and-half; if it’s thicker, add a little extra milk and blend to incorporate. Pour the batter into a pitcher and set aside while you prepare the toppings. Mix together melted butter with canola oil in a small bowl or jar. Set this on the stove with a pastry brush. Heat a nonstick skillet over medium-low heat, then brush the surface with the butter-oil blend. The pan is hot enough when a flick of water sputters in the oil. Pour a little batter in the middle of the pan (about a small saucer's worth), then immediately lift and tilt the pan, rotating your wrist, to spread the batter to the edges of the pan. Set the pan back on the burner and cook the crêpe until the edges begin to lift up. Flip the crêpe over to cook the other side; both sides should be a light golden brown. Serve immediately or place on a plate in a warm oven while you cook the remaining crêpes. 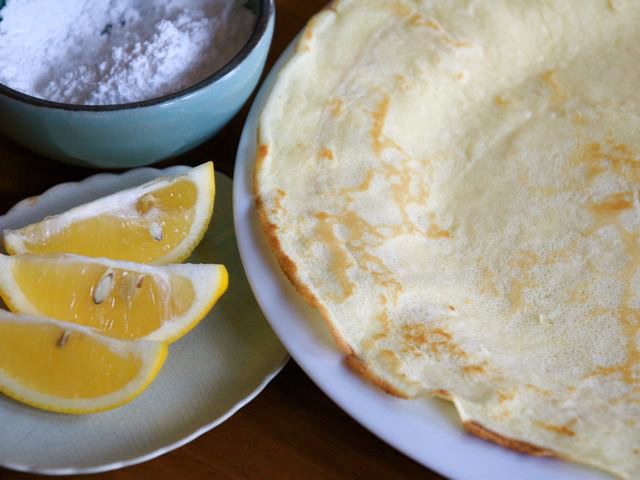 To serve: Spread a crêpe with butter, then top with a squeeze of lemon and a sprinkling of powdered sugar. Or spread a crêpe with butter and a spoonful of jam. Or fill a crêpe with fried apples or other filling. Roll up and eat immediately.